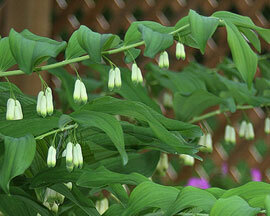 Here is a woodland shade plant that is undemanding, yet eye-catching with three seasons of interest. Foliage is single stemmed. Pale white flowers dangle underneath the stem in late spring, and green berries during the summer turn dark blue when ripe in the fall. Very unusual and striking foliage. May colonize once established but, is not aggressive and will not choke out other woodland plants. Grows well at the base of trees.